Many of the rooms at Mountain Melodies feature private balconies where you can enjoy the beautiful scenery of the Great Smoky Mountains! Step outside in the morning to inhale a deep breath of the fresh mountain air and sip on a hot cup of coffee. The evening hours are also a splendid time to relax on the balcony as you count the twinkling stars of the night sky. Whether you want to stay at the front of the hotel where you can watch all of the action of the Parkway or in the back of the hotel facing the woods, you will love spending time on your private balcony! Whether you are planning to spend a day walking around the shops at The Island in Pigeon Forge, exploring the thrill rides at Dollywood or hiking the trails at the Great Smoky Mountains National Park, it is important to stay hydrated throughout the day! The awesome news is that the rooms at our hotel in Pigeon Forge TN contain a mini-refrigerator where you can store bottled water and all of our other favorite beverages! The refrigerator also comes in handy if you have leftovers from dining out that you want to keep as a snack for later. This sure beats having to keep a cooler in your room and having to constantly fill it with ice! If you are planning a romantic escape to the Smoky Mountains to celebrate a wedding, anniversary or other special occasion, be sure to check out our rooms with a Jacuzzi tub and fireplace! There is nothing quite as romantic as cuddling by the fireplace as the gentle glow of the fire creates the perfect ambiance throughout your hotel room. The Jacuzzi tub also feels delightful after a full day on your feet. Sit back and let the massaging jets soothe your sore muscles and put you into the ultimate state of relaxation! We know how important it is to stay connected throughout your vacation, so we are pleased to offer free wireless internet access to all of our guests. Whether you need to check the latest weather forecast, send a text or email to a loved one or get directions to a local attraction, you will have all you need at your fingertips! 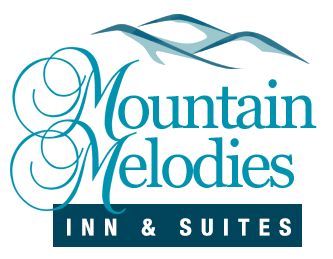 There is no need to stay at a hotel where you have to pay for wireless internet when you can get it for free simply by staying at Mountain Melodies! Check out all of the rooms at our hotel in Pigeon Forge TN today to plan your Smoky Mountain vacation and to enjoy all of our fabulous room amenities! We hope to see you soon at Mountain Melodies!